Taking its cues from classic doomsday movies such as The Day of the Triffids and The Omega Man (with a healthy dose of Dawn of the Dead thrown in for good measure), Night of the Comet (1984) is an irresistible slice of Reagan-era B-movie fare which features Cyndi Lauper dance-alongs as well as some truly gravity-defying hairstyles. To celebrate the release of Night of the Comet this coming Monday (22 September), we have THREE Dual Format copies of Thom Eberhardt eighties favourite to give away to our readers, courtesy of cult movie specialists Arrow Video. This is an exclusive competition for our Facebook and Twitter fans, so if you haven’t already, ‘Like’ us at facebook.com/CineVueUK or follow us @CineVue before answering the question below. 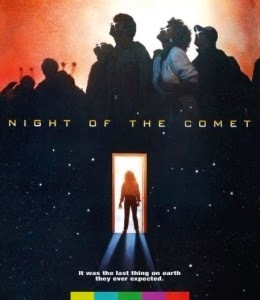 Eighteen-year-old Reggie (Catherine Mary Stewart – Weekend at Bernie’s, The Last Starfighter) misses out on the event-of-a-lifetime when she ditches watching the comet in favour of copping off with the projectionist at the cinema where she works. But this turns out to be a wise move when, the next day, she discovers that the entire population has been reduced to piles of red dust – leaving only Reggie, her sister Sam (Kelli Maroney – Fast Times at Ridgemont High, Chopping Mall) and a handful of other survivors to fend off the roving gangs of glassy-eyed zombies. What was the original working title for Night of the Comet? Thom Eberhardt’s Night of the Comet is released on Dual Format from Monday 22 September, courtesy of Arrow Video. This competition closes at 6pm on Thursday 25 September 2014.